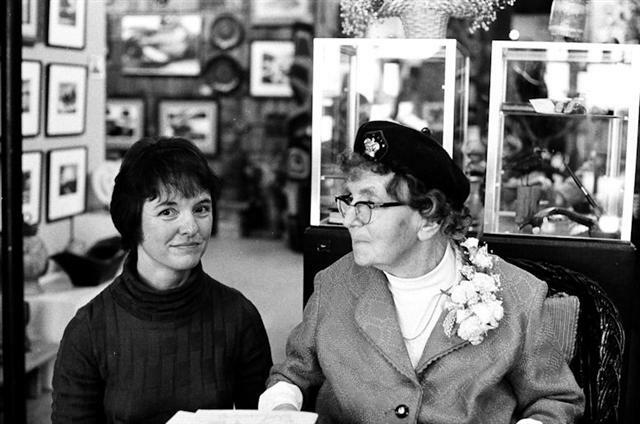 Minnie Rose Lovgreen - Farming, Local Interest (photo is of Nancy Rekow and Minnie Rose at a 1975 autograph party). 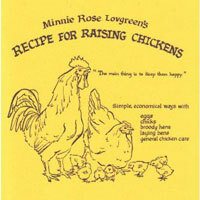 At age 85, shortly before her death, longtime islander Minnie Rose Lovgreen wrote what has turned out to be a best-selling local classic: "Recipe for Raising Chickens" (1975). Lovgreen and her husband moved to Bainbridge Island in 1920 and ended up operating a dairy farm. Along the way Lovgreen also cared for an assortment of non-bovine animals, including chickens. In order to pass on her accumulated knowledge, Lovgreen's friend Nancy Rekow taped their conversations about raising chickens and saw to it that Lovgreen's 31- page booklet got published. The booklet sold out within a few months after its first printing and a second edition of 20,000 booklets soon followed. Today, with renewed interest in raising chickens, the booklet is in its 3rd edition and is available at the library as well as at local stores and at the Bainbridge Island Historical Society. 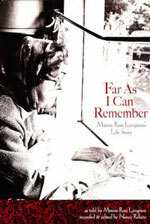 Rekow has also recently edited and published Lovgreen's memoir Far As I Can Remember: Minnie Rose Lovgreen’s Life Story (2010). For more information on Lovgreen go to http://nwtrilliumpress.com/.